Men can use sports as a common ground. If you have 10 guys in a room, 9 of them are sports fanatics. Whether it's baseball, football, soccer, or (like Derek) "extreme" sports like BMX, motocross, and jet skis. Men talk about sports to avoid talking about sensitive subjects such as feeling fears and emotions. Most men can at least find one thing in common with another guy, and it usually has something to do with sports: whether they find that they root for the same team, like the same sport, or played the same sport. 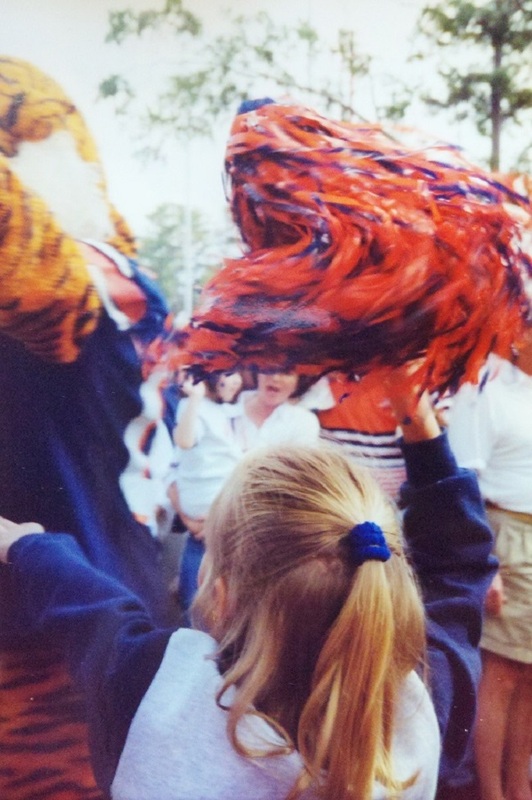 My love for Auburn began at a very young age. As a lover of sports and a member of the female gender, I feel like I am in the minority when it comes to sports fans in general. Sure there are women who don't mind watching, or those who will gladly participate in a tailgate for fun. But the women that truly enjoy sports, who played sports, and who can understand the game without phoning a friend are few and far between. Sure I don't know everything, but that doesn't change the fact that I could probably tell you more than the next girl. 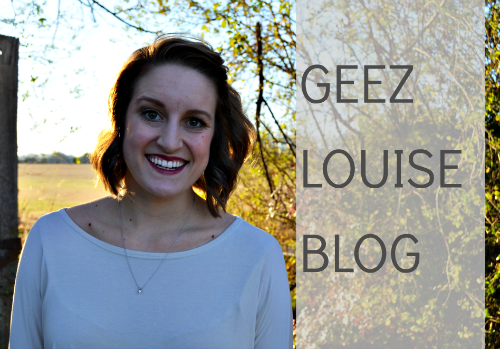 So how do you hold your own when it comes to sports talk? Here are some pointers. Talk about what you know. If your thing is football, talk about football. Watch football. Know what play means what and for heavens sakes, don't ask if the blue/yellow/orange/red lines on the field (on TV) are really there. That will get you some side eyes for sure. Don't pretend. If you don't know something or don't enjoy a certain sport, don't pretend like you do. A guy (or anyone for that matter) will have way more respect for you if you simply admit "I don't really like/understand basketball." Than if you say something like "OMG I can't believe they didn't call a foul ball on that play." Stick to your guns. If you root for a team that your friends or fellow game-watchers aren't a fan of, so what? There's no shame in rooting your team on, even if their not winning. Especially if their not winning, because this shows that you're a real fan and not a "bandwagoner." 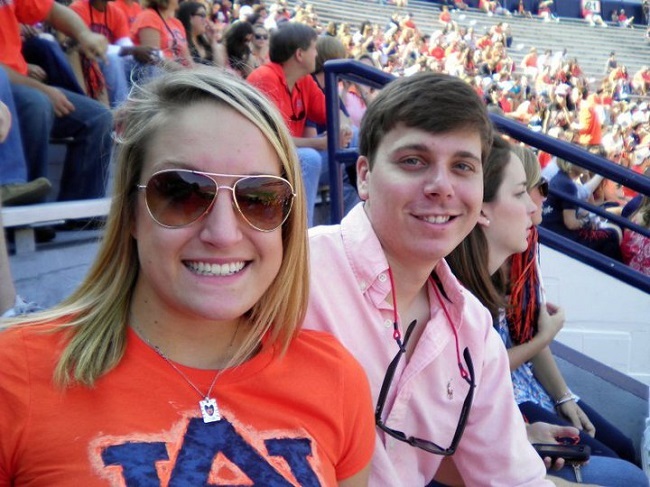 Football game in Auburn (WAR EAGLE) with some friends from high school. Help a sister out. Maybe your friend came to the tailgate with you because she just reeeallly thinks John is cute, and she doesn't have a clue what is going on during this football game. Share the love and enlighten her. You don't have to go in to details, but you can at least makes sure she knows the difference between a field goal and first down. Or a double dribble and a bounce pass if you're watching basketball. Celebrate. Be effing proud when your team wins. High five, chest bump, shotgun a beer. Whatever you do, do it loud and proud because your team just spanked dat tail. 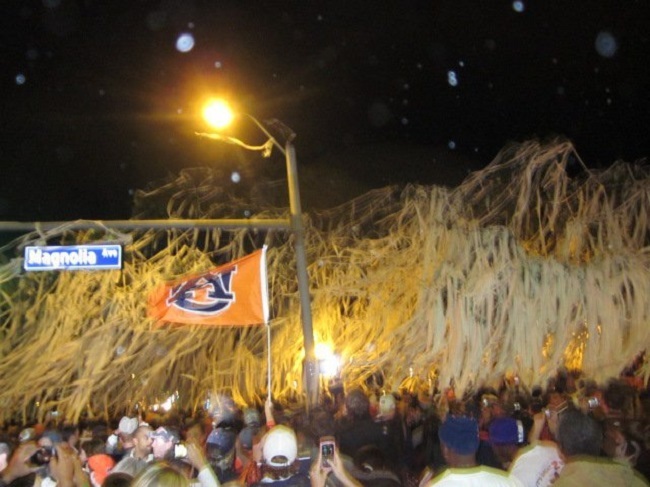 Toomer's Corner after Auburn's 2010 win for the SEC championship. If all else fails, grab some beer and suggest a game of beer pong. Everyone loves beer pong. This post is fantastic!! I found you from Sarah's tweet and I'm so glad I did!! 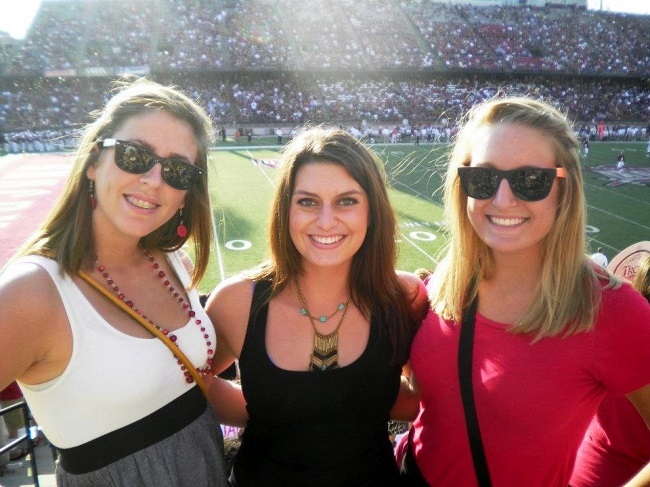 Love finding other football lovin gals!! Um, HOW DID I NOT KNOW YOU ARE AN AUBURN FAN?! And went to Troy?! My home is about 30 minutes from Troy and I graduated from Auburn aaannnndddd was at The Vault when Auburn beat Oregon. I agree with you in being the minority, but I don't feel it when I'm at Auburn. It's just the atmosphere I guess. Or SEC football - where women should know the lingo. This post is freaking awesome!! I LOVE football. But I find that most guys work from the automatic assumption that if you're a fan of the team it's only because you think someone's cute. It's so FRUSTRATING. I want to enjoy the game, but by the time I get done defending the fact that I DO actually know what's going on and I DO like them for more reasons then someone's cute, it's just ruined. I hate watching sports with males. Hate it. Is it football season yet??? LOVE this post! This a GREAT post and so true! I love football and I know players and teams and whatnot but I fully admit that I don't understand the I-formation and while I know what a 3-4 defense is vs. a 4-3, I'm not necessarily going to be able to see it on the field. but no really the people that pretend and sound like idiots need to go home. especially those of the female variety trying to impress. I know far too much about baseball and football for being female (hel-lo I play fantasy football every year with brother and his friends!) however, I won't even TRY to pretend I understand hockey (or anything related to it) I know my limitations!! But I do feel like I am in the minority. I also am able to admit when I don't know something. I can't stand it when the assumption is that I am paying attention to football or baseball to "impress someone". hell no- I like watching! Oh my goodness! War Eagle!! 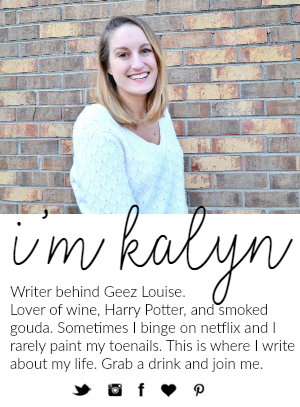 I LOVED LOVED LOVED Auburn! I need to go back soon because it's been too long. Ahh...I am so so sad about the trees but I am so glad they got a truly great send off after our Championship win. I absolutely love this post. I am one of those females who love football. My poor dad had 2 girls and decided to tell me about football from an earlier age. My father in law was impressed the first time I met him that I actually understand the game and enjoy watching games with my husband. Même ainsi, mis à part les aspects techniques derrière les baskets, air jordan 5 fear il y a une autre histoire qui rend ces chaussures particulières beaucoup plus excitantes que beaucoup de gens ne le savent. En tant que domaine de la médecine, l'ophtalmologie nécessite une étude approfondie et intensive. Michael Zhu est certainement un auteur spécialiste de Il a créé un certain nombre d'articles de contenu dans une variété de contes fascinants de chaussures de sport comme les chaussures de course cortez nike femme noir et blanc Air Jordan Fusion Dunk SB Air Max. Je vais utiliser la troisième définition Nike Shox Navina, caractérisée par l'originalité et l'expressivité. Les dessins sont à la mode et ont une énorme popularité parmi les hommes et les femmes. Avec mes conseils les mieux notés, trouver cette robe de rêve pourrait être une expérience de travail amusante et heureuse chaussure adidas zx 750 que vous ne négligerez jamais.